The Quest for Pura Vida is our premier expedition itinerary in Costa Rica. Based on Richard Bang's award wining documentary, the Quest for Pura Vida expedition combines the cloud forests of Monteverde and the active Arenal Volcano with the verdant lowland tropical forests of Tortuguero to highlight Costa Rica’s diversity of nature and culture. The Costa Rica Quest is a vacation to Costa Rica and a personal journey to find your own Pura Vida (Pure Life). With your naturalist guide and a small group of like minded travelers, explore the Monteverde Cloud Forest Reserve, home to numerous endemic flora and fauna including the Resplendent quetzal. The picture perfect cone and active lava flows of the Arenal Volcano provide the rare opportunity to view and learn about this geological wonder. Tortuguero National Park encompasses one of the largest protected rain forests in the country, made easily accessible by a series of slow moving rivers, streams and canals. (From June through October Tortuguero is home to thousands of nesting Green sea turtles). At every turn, there are chances to view wildlife such as monkeys, tapirs, caimans, iguanas, and countless bird species while learning about the complex relationships connecting these environments. Accommodations for the Quest for Pura Vida include boutique hotels and wilderness lodges. Your quest begins upon arrival at San José Costa Rica’s Juan Santamaría International Airport. After passing through immigration you will be met by a local Costa Rica Expeditions guide and transfered to your hotel in San José. After a welcome orientation breakfast with your naturalist guide, enjoy a scenic 1.5-hour drive to Nectandra Cloud Forest Garden, the centerpiece of 257 acres of primary and secondary forest featuring exhibits on cloud forest ecology and a place for scientific field research. After lunch at the gardens, depart for the 3.5-hour winding road to the Monteverde are. 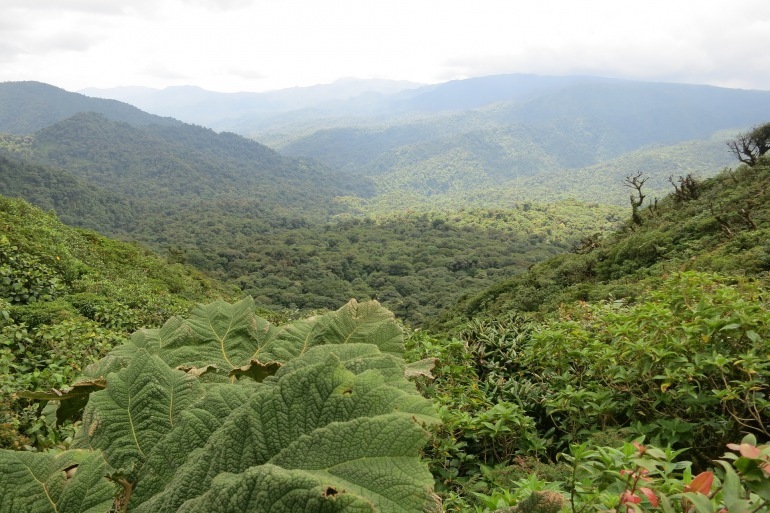 Monteverde means "green mountain" and is an appropriate name for these forest-cloaked slopes. Check in to your hotel, visit the Ecological Farm and perhaps take a stroll in the hotel gardens before dinner. Set out on foot with your guide through one of the most outstanding wildlife sanctuaries in the new world tropics, the Monteverde Cloud Forest Reserve. The perpetually misty forests of the Reserve, founded in 1972, encompass 25,000 acres and six distinct life zones and protect more than 100 species of mammals, 400 species of birds and 1,500 species of plants. So many habitats in such a small area, along with extensive trail improvements, allow visitors to enjoy a rich diversity of flora and fauna with relatively short distance and easy walking. Majestically tall trees adorned with orchids, bromeliads ferns and vines, dwarf man and other inhabitants of the cloud forest. From January to July, depending upon your luck and patience, you may observe the Resplendent Quetzal (occasionally a dozen or more individuals at once). Other species include the Three-wattled Bellbird, the Emerald Toucanet, and White-faced and Howler Monkeys. Return mid-day to the hotel for lunch and siesta. This afternoon visit the Butterfly Garden where 40 species of butterfly are raised and displayed in netted flyways that recreate four distinct habitats: the hot lowlands, mid-elevation forest edge, deep forest and cloud forest. Be sure to bring your camera to capture the vivid colors of the blue morpho and other butterflies. The tour finishes at a special exhibit on leaf cutter ants, one of Costa Rica’s most enterprising insects. While it’s easy to watch them working on the forest floor, the Garden provides a way to see them working underground. After the tour you can go back into the gardens for more pictures, check out the medicinal plant garden or bird watch from the balcony. This morning, depart by four-wheel-drive vehicle and boat to Arenal. It's a 2-hour drive to Rio Chiquito, a small town on the shore of Lake Arenal, where you'll board a boat for the transfer across the lake (approximately 30-40 minutes depending on wind conditions). You will likely glimpse the postcard-perfect cone of the Arenal Volcano long before reach it. The boat will dock near the Arenal Dam where your transportation will be waiting to continue with the activities of your day. Though Arenal Volcano has been dormant since 2010, it still spews steam and gas on occasion. On July 29, 1968, the mile-high cone awakened from its 400-year slumber with a fateful earthquake. Since that time, it has been one of the most active volcanoes in the world. After breakfast, depart for a morning hike to the Arenal Hanging Bridges. This project consists of eight fixed bridges, ranging in length between 8 and 22 meters, and six hanging bridges, built with the latest techniques and designed with an eye for both beauty and safety. The hanging bridges are between 48 and 98 meters long. All the bridges are made of galvanized steel and high-strength aluminum. The safety mesh and the suspension cables are all galvanized steel. The entire project was designed to blend with the natural environment, leaving the forest virtually intact. The trails, covering a distance of about 3.1 km, are right inside the forest. As you walk, you can appreciate a great diversity of flowers and wildlife that are typical of the rain forest as well as some imposing views of Arenal Volcano, weather permitting. Next head to a private reserve near the north-facing slopes of the Cordillera de Tilarán, which offer volcano views to be enjoyed from an aerial Sky Tram that rises 236 meters in a 1250-meter ride. At the top is a mirador (lookout point), and the start of the Sky Trek zip line circuit. There are currently ten zip line cables ranging in height from 30 meters to 200 meters and in length from 200 meters to 750 meters. After gearing up and learning safety measures from your guide, you'll zip along nearly two miles of cables, seeing the rainforest as well as getting a panoramic view of the volcano and lake from a whole new perspective. Finish the day at Ecotermales La Fortuna. Owned and ran by the local Hidalgo family, native settlers and entrepreneurs of La Fortuna, these hot springs consist of 5 free-flowing pools set in a natural river gorge. Water temperature ranges from 100ºF to 109ºF depending on the pool. An assortment of blended smoothies and cocktails are prepared at the bar located in the pool area (additional cost). A Costa Rican Home style meal in the restaurant, modeled after the first house that Don Manuel and Doña Hortemida Hidalgo built when they settled on the farm in 1940, is included. The hot springs are located 700 meters off the main road that connects between Lake Arenal Dam and the town of La Fortuna. After an early-morning breakfast, drive 5 hours to the Caño Blanco dock, where you will meet the boat for the 1.5-hour boat ride to Tortuguero. The last part of the drive takes you through banana plantations. Until the 19th century, Costa Rica was very poor with an economy based on subsistence agriculture. Then the introduction of coffee provided a product suitable for export. Coffee was followed by bananas; both remain two of the most important crops in Costa Rica today. The canals of Tortuguero provide refuge for many animals and birds, and along the ride to Tortuguero you may have the opportunity to sight some of these animals and birds. Arrive at Tortuga Lodge mid to late afternoon. In the morning explore the inner creeks of the Tortuguero National Park with your guide. Originally intended to protect a major nesting beach of the Atlantic Green sea turtle, Tortuguero National Park now protects 51,870 acres, one of the last large areas of tropical rain forests in Central America. Additional boat trips are available at extra cost. From June though October a miracle of nature occurs in Tortuguero when thousands of endangered green sea turtles come to nest on Tortuguero Beach. During this season guided night walks will be led (at additional cost) along the beach to witness 300 pound females emerge from the sea to lay and bury her eggs. Later in the season, guests can view the hundreds of baby turtles hatch and scurry to the safety of the seas. Today you'll also visit the Sea Turtle Conservancy Visitor Center, a museum founded by the Sea Turtle Conservation, formerly known as the Caribbean Conservation Corporation (CCC). The late Dr. Archie Carr began to study and tag the thousands of Atlantic green sea turtles that every year, from June through October, come to Tortuguero Beach to lay their eggs. The study began in 1959 and has continued without fail ever since, under the auspices of the STC. It is the longest-running continuous study of its kind in the world, their work has greatly improved the survival outlook for several species of sea turtles and it has had a profound effect on the community of Tortuguero. The organization began its work in Costa Rica, but has expanded its research and conservation efforts throughout Central America and the wider Caribbean. Depart in the morning from Tortuga Lodge, crossing the Tortuguero River by boat. You'll then board your 30-minute Costa Rica Expeditions light charter flight (seat in plane) from Tortuguero to San José. Upon arrival transportation is provided to a coffee plantation for a tour. Located in the coffee capital of Costa Rica, Alajuela, the Doka Estate farm belongs to the Costa Rican Vargas Ruiz family, pioneers of coffee production for more than 70 years. Learn all about production and harvesting as well as the processing plant and roasting of the grain. The tour takes you through all stages beginning with a seed bed and ending in the Coffee House with the finished product. Your Costa Rica Quest for Pura Vida ends with a transfer to the International Airport approximately two and a half hours before your flight's scheduled departure time. Or begin your trip extension to the rainforests of Corcovado National Park, the Pacific beaches of Manuel Antonio or the dry tropical forests of the Guanacaste Peninsula. The minimum age on the Quest for Pura Vida is 12, unless booking a Family Departure.